After giving Import Blog - Export Blog - Delete Blog functionality in blogger, so many blogspot users have deleted their blogger blog accidentally. if you also have deleted your blog and want to recover or restore your blog from blogger then below is a detailed post regarding how you can reactivate your accidentally deleted blog. 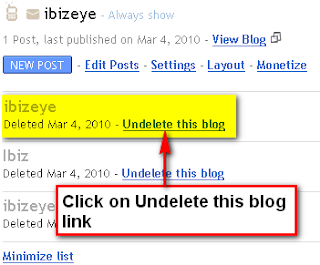 Note: You can recover your blog if it is deleted LESS than 90 days ago (3 Months). 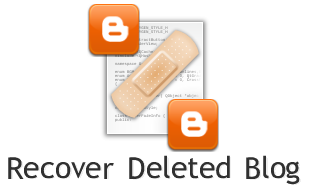 Get free information related to "How to Restore-Recover Deleted Blog in Blogger". I do not have the option - "undelete the blog" at my dashboard page, any idea? OMFG!! Thank you so much! I LOVE YOU!! @ senbizz, was it about any illegal or piracy material? if so i don't think it will be recovered. but if you genuinely think that blogger has detected it as a spam by mistake - You can try contacting them from http://www.google.com/support/blogger/bin/request.py?contact_type=contact_policy and explain to them that is not spam..